Firstly, I should issue a warning, if you are vegetarian, this post is not for you. It's about delicious, juicy and tender steak. I think the picture says it all really, but to tantalise you even further I'll tell you a bit more. 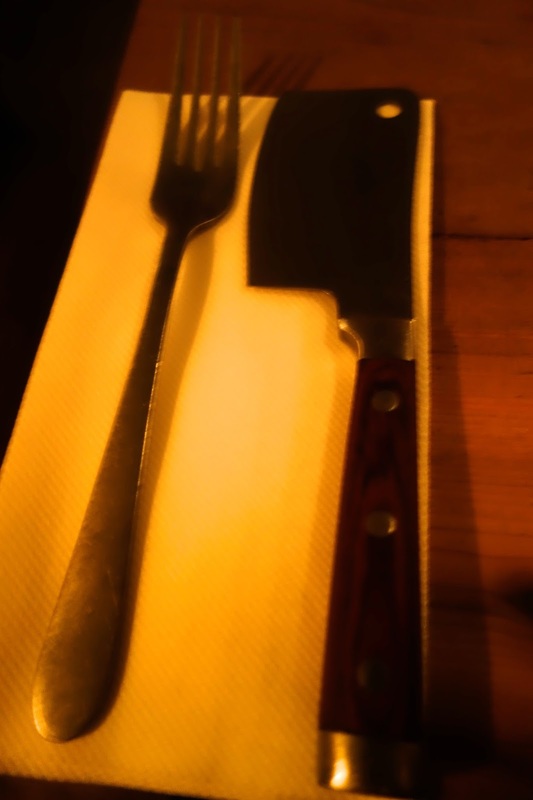 Flat Iron is a simple, one dish steak restaurant that prides itself on a rustic and minimalistic set up. It's got the philosophy right too, why do lots of things semi-well, when you can do one thing really well? Especially if that one thing, is a succulent and affordable steak that has people waiting over two hours for a table at 7pm on a Friday night! I'm not exaggerating either, Dan and I rocked up around 7pm on Friday and were told it was going to be over an hours wait. They offered us the choice of waiting at the bar, or leaving and coming back. The bar was heaving so we chose to come back and took ourselves off for a drink elsewhere whilst we waited. Now this will sound really geeky, but I was totally impressed with Flat Iron's booking system. (Ha! I did warn you!) By booking system, obviously I don't mean the fact that you can book a table, because naturally you can't; just like all other trendy restaurants in London who like to keep eager punters queueing out the door. What I actually mean is, when we said we'd come back, they took my mobile number and sent me a text which had a link, you clicked on the link and it took you to a website that told you your position in the queue so you could keep an eye on it. When it got down to the last 5 or so, they sent you a text saying 'you're table is ready, come back within 10mins to be seated'. It's so simple, but I just really liked being able to keep an eye on the little counter clicking down every time a table left, teasing me with how long it would be until I could eat. When you do get seated it's on long bench tables with fixed seats - don't try and do what Dan did and move the stool, you just look silly...! You're greeted by a hipster waiter who puts a mug of complementary salted popcorn in front of you, along with a carafe of water and glasses. This place had carafe's coming out of their ears, seriously; even when you ordered a glass of wine it comes in a carafe with a tumbler to drink from. See - simple and trendy, tumblers are the new jam jars didn't you know. The menu's are displayed on the walls like posters and offer you a really simple choice; Steak which comes with a side salad, then accompaniments of dripping cooked chips, creamed spinach, greens and another side salad. You also get a choice of sauces should you wish. The waiter asked us how rare we'd like our steak (medium rare for me and rare for Dan) and we ordered two lots of chips, one creamed spinach and peppercorn sauce on the side. It didn't take long for the food to come, and I'm not going to lie, it oozed with juicy and bloody goodness, my carnivorous side was elated (yes, I did just say that - hence the vegetarian warning). Now, let me tell you about the steak. There is only one type of steak, Flat Iron, (which is sometimes also known as top blade roast, shoulder top blade roast, top boneless chuck, petite steak butler steak or Wagyu steak), the steak is served sliced on a slate, showcasing it's perfectly pink colouring. For all you steak connoisseurs out there, the steak isn't marbled and there is one main reason, because this isn't an expense cut of steak. Seriously, Flat Iron sell the steak for just £10. Yep, only £10, but it is divine. Not the best I've ever had or anything, but by far the best steak I've had for under £25. Dan was so shocked he almost fell of his sturdily stuck down stool! We'd seen the girls at the end of our table order dessert (not the bitchy ones, they just stared at everyone else common enough to eat dessert...fun night they must have had) and were intrigued by the whipped cream dispenser that dessert came from, so naturally we ordered one. Turns out it was caramel moose and came with a little pot of sea salt that you should delicately sprinkle on top of the moose to enhance the flavour. Well, I am not very delicate and ended up sprinkling a little too much salt onto the moose, so much so it was only right we had to scoop heaped spoonfuls in order to counteract the salt; and then order another so that Dan could sprinkle it this time and show me how it's done. Fit to burst we finished off our drinks and got the bill - which came to less than £45 including tip! Seriously. Nope I'm not joking, two steaks, three sides, drinks and dessert, all for less than £50! I'd definitely recommend this place for some simple, affordable good quality steak before heading off into the night for a few more drinks. This isn't a 'we'll make a night of it affair' at all, so be warned; the food is quick and the waiters are used to high table rotations - after all there are people watching the ticker!